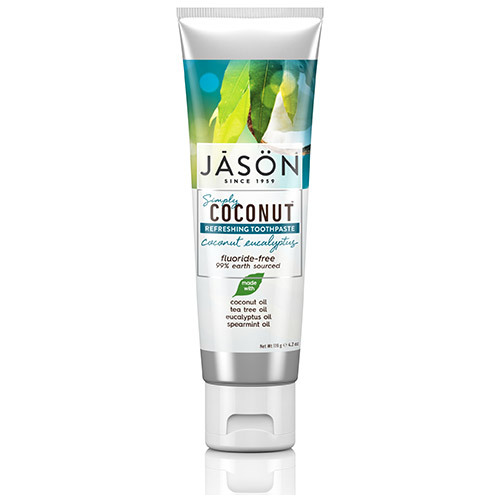 Jason Simply Coconut Refreshing Toothpaste allows you to perk up your smile with the simple wholesomeness of coconut oil. Made with only the most essential ingredients from the earth, this refreshing toothpaste harmoniously combines virgin coconut oil with freshening spearmint, eucalyptus leaf and tea tree oils to give your teeth a confident sparkle. The cooling coconut eucalyptus taste leaves your breath fully fresh and revived. Use with your favourite mouthwash twice a day for a brilliant smile and fresh breath. It’s your time to smile and shine. Glycerin, Aloe Barbadensis Leaf Juice *, Calcium Carbonate, Sodium Cocoyl Glutamate, Citrus Limon (Lemon) Peel Oil, Citrus Paradisi (Grapefruit) Peel Oil, Cocos Nucifera (Coconut) Oil*, Eucalyptus Globulus Leaf Oil, Gaultheria Procumbens (Wintergreen) Leaf Oil, Helianthus Annuus (Sung Melaleuca Alternifolia (Tea Tree) Leaf Oil, Mentha Piperita (Peppermint) Oil, Mentha Viridis (Spearmint) Oil, Bambusa Arundinacea Stem Powder, Citrus Grandis (Grapefruit) Seed Extract, Commiphora Myrrha Resin Extract, Ascorbic Acid, Cellulose Gum, Sodium Bicarbonate, Natural Flavour. Safe to swallow if using directed amount. If you accidentally swallow more than used for brushing, seek professional assistance immediately. 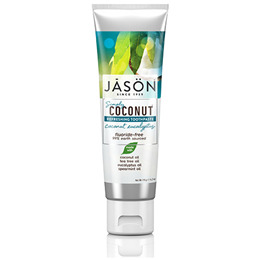 Below are reviews of Jason Coconut Eucalyptus Refreshing Toothpaste - 119g by bodykind customers. If you have tried this product we'd love to hear what you think so please leave a review. I found the toothpaste to be a bit on the thin side, so you tend to use more, and couldn't taste any eucalyptus in it, so a bit expensive, as it goes quite quick.